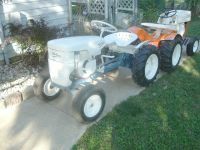 I ended up with 2 old cushman scooter's i'm kinda excited about.One is supposed to be a 1949 told by the owner but a cushman group on the net says it's between a 1950-57 cushman highlander. The picture above and the ones that follow below is of the 1950-57 highlander model.I can't find out for sure exactly what model it is I'm still looking.They actually made a lot of different models back then.Kinda looks like the civilian airborne model but I was told by a guy local it is not.It has been modified somewhat.It does not have the original engine on it,it has a 8hp. kohler so they did a lot of work because the rotation of the kohler was backwards compared to the cushman. It looks like the engine is out of a wheel horse to me.Thats an old round hood wheel horse gas tank if i've ever seen one so you see it still gets back to tractors my friends lol.I really kinda hated they cut the frame for the starter generator to clear but ah well I guess that will give me an excuse to just go crazy with this thing and make it my own.I wanted something to run up and down to my uncle nick's anyways this will be cool for sure. I love the handlebars on these things they have that really old harley style look.It had some goofy looking turn signals on it and I took them off I'm pretty sure they never had them in the 40's-50's anyways. I don't know if this model really ran the square seat or if it had the bicycle with the springs.I really prefer the bicycle type it would make it look even older to me. You'll notice the turn signals on the back I took them off also they were broken up anyways.If anyone does know exactly what this is please email me i'd love to know. Ok well now for the other one.It's supposed to be a 1957-58 Pacemaker.I haven't got any pics of it because well it's in about 30 million pieces lol.The bad is it is all apart and i'm hoping it is all there because if it's not i'm in big trouble the parts for these things are way way up there.The good side is it has a brand new cushman husky motor,It is the sharpest small engine i've ever seen! !.The shroud is solid chrome.The guy I got it from had a bunch of parts sent off a rechromed,front forks,engine shroud,wheels I mean this thing will be a ride to see if I can get it restored.Thinking about going with the torqouise and white like the old 57 chevy's. Well here ya go.I found this pic on the web,it's a 1958 pacemaker mine is supposed to look just like this one.And check it out torquoise and white.I may not paint it that now I don't like my stuff to look like other's lol,maybe canary yellow and white! !.